Declaration of Independence Centennial Memorial Broadside. New York: James D. McBride, Printed by the Colombian Publishing Company, 1876. 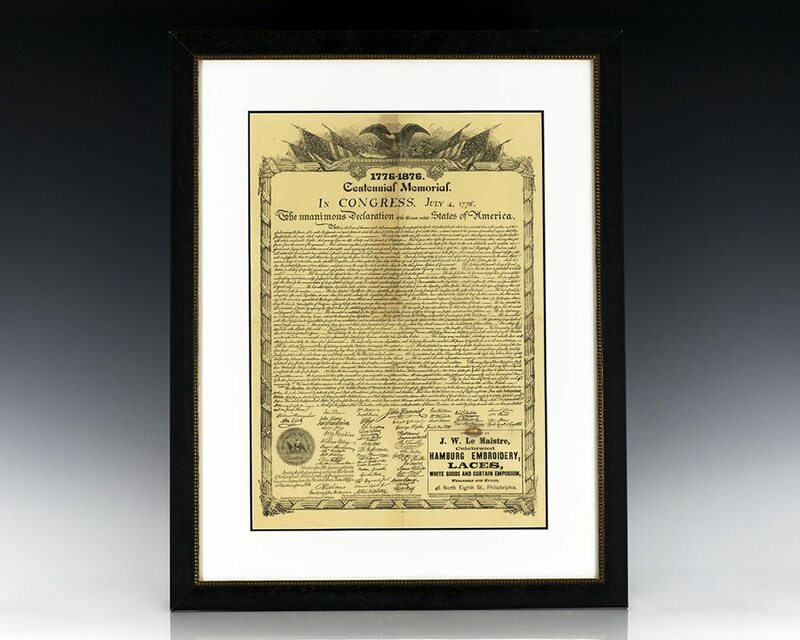 Rare Centennial Memorial facsimile broadside of the Declaration of Independence. In near fine condition. The document measures 14 inches by 17 inches. Matted and framed. The entire piece measures 19 inches by 23 inches. An excellent example. On the 100th anniversary of the signing of The Declaration of Independence, James McBride printed this detailed broadside. The broadside is decorated with a lovely engraved border featuring ribbons and stars and an elaborate header that depicts a bald eagle flanked by six American flags and is verified with the Department of the Interior’s engraved seal and the Secretary’s engraved signature. New York: Charles Scribners, 1925. First edition, first state with “chatter” p. 60, “northern” p.119, “sick in tired” p.205, and “Union Street station” p. 211. Octavo, original dark green cloth. In near fine condition, with the gilt lettering to the spine bright, light rubbing to the endpaper. Housed in a custom clamshell box. 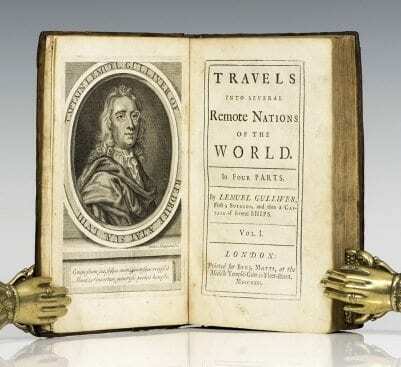 Travels into Several Remote Nations of the World (Gulliver’s Travels). Mixed early first editions of Johnathan Swift’s masterpiece, Gulliver’s Travels. Volume I is a Teerink AA edition, Volume II Teerink B edition. Octavo, bound in contemporary calf, engraved frontispiece, woodcut initials, five engraved maps, gilt titles to the spine. In near fine condition. A very nice example of this classic in English literature.